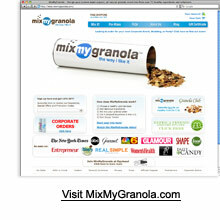 MixMyGranola is a pretty cool service. In a nutshell, it's website where you select all of the items you'd like in a custom-made granola and they ship you exactly what you want. The company sent me a granola to try which contained organic granola, dried blueberries, roasted almonds, flax seeds and oatbran flakes. I'm happy to report that it was delicious. The granola arrives in a 16 ounce cardboard tube. The cylindrical package was a great conversation piece on my table in the weeks before I tried the product. My concern was whether or not the container would keep the granola fresh. After waiting nearly three weeks, I was very pleased that the granola was indeed very fresh... not the slightest hint of staleness. The company's website states that "your granola will never expire prior to three months from the date of shipment." The thing I like best about the MixMyGranola service is the plethora of ingredient options they offer to make your custom granola (see below for a taste). As a breakfast expert who makes a lot of homemade granola, I find myself visiting MixMyGranola.com for inspiration for my own creations. Case in point: In the sample they sent, I was impressed by the oatbran flakes included in the granola. They added a flavor and texture that really fit with a homemade granola intended for breakfast. 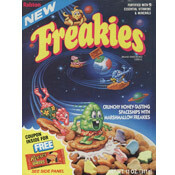 Exploring their site, you'll see that you can add other types of existing cereal pieces (ie. Froot Loop-style piece and Rice Krispies-style pieces). I plan to really explore this concept in my own granola test kitchen. With an average price (if you don't go too crazy with ingredients) of around $10 a package, MixMyGranola granola is pricey by grocery store standards. However, you could argue that the price is reasonable considering the service. My only complaint about the actual product is very minor. I would have liked to have seen more clumping and browning in the base granola. The oats had more of a lightly-toasted Muesli feel than I usually prefer. Overall, I'm excited that this service exists and I was pleased with the end product. Definitely check these guys out. Granola Options: Organic Granola, Low-Fat Granola, Cinnamon Granola, Gluten-Free Cereal, French Vanilla Granola and 100% Organic Muesli. Fruits: Cranberries, Dried Blueberries, Organic Raisins, Goji Berries, Dried Kiwi Slices, Dried Raspberries, Dried Apricots, Dried Strawberries, Dried Blackberries, Golden Raisins, Banana Slices, Dried Bing Cherries, Dried Apples, Dried Pineapple, Dried Mangos, Dried Melon Slices, Organic Dates, Organic Banana Chips, Dried Papaya and Dried Plums. Nuts & Seeds: Roasted Almonds, Pistachios, Sunflower Seeds, Hazelnuts, Brazil Nuts, Walnuts, Roasted Cashews, Macadamia Nuts, Pecans, Organic Peanuts, Organic Soy Beans, Organic Pepitas, Chia Seeds, Hemp Seeds, Organic Flax Seeds, Organic Amaranth and Sesame Seeds. Extras: Coconut Shreds, Oatbran Flakes, Dark Choco Bits, Organic Gummy Bears, Chocolate Mini Morsels, Peanut M&Ms, Animal Cookies, Dark Choco Almonds, Peanut Butter Bits, Organic Jelly Beans, Chocolate Raisins, Coconut Flakes, Fruity Loops, Honey Smacks, Cocoa Crisp Bites, Mini Yogurt Pretzels, Peanut Butter Pretzels and some 10 other options. 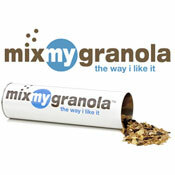 What do you think of MixMyGranola Granola? Cool idea. I know a couple who this would make a nice gift for. Thanks for turning me on to this.